Multiple jets from a single laminar container...Is it possible? I just found this website yesterday morning, and have read through about every post in this forum, and haven't found an answer. I don't think anyone has tried it yet, and the closest thing I could find was the multiple jet patent that is used on hot tubs. That idea would be nice for a small 2' long stream, but i want to create something large that has two or three jets that can be angled from the same container. 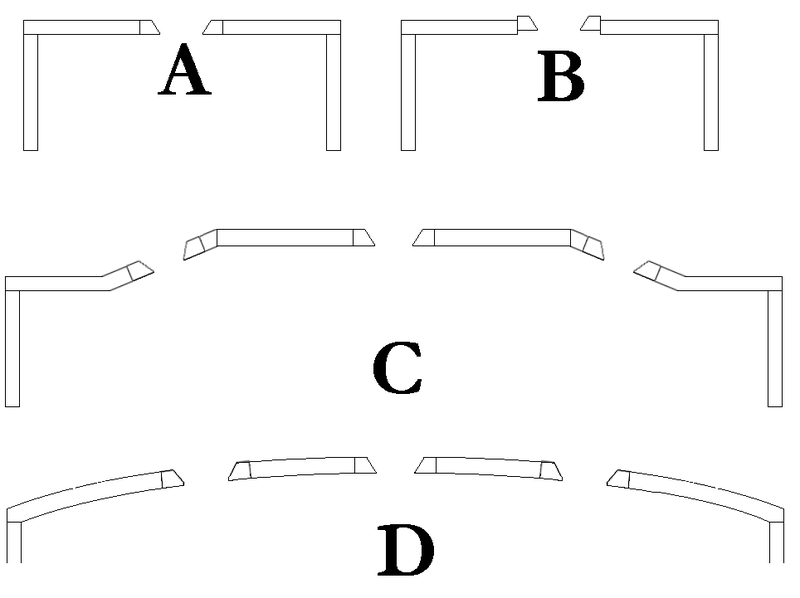 I have lots of plastic welding experience, and currently have 12", 16", and 24" sch 40 PVC pipe laying around the warehouse, so I know I can make a container large enough to slow the water velocity down, but the multiple nozzles is where I am unsure. From what I have learned so far, the cleanest streams of water are being created by the machined brass inserts. The side that goes inside the nozzle is flat, and the side exposed to the air, has a taper to it that starts out very sharp....Correct? Example "A" would be the best way for the brass insert to be mounted correct? Would example "B" create distortion to the stream? Would it be possible to use a 16" diameter container to mount three brass inserts like in example "C"? The center jet seems like it would work just fine, but I am unsure what would happen with the two angled jets? Got any ideas? I have also gotten pretty good at bending arcs out of acrylic sheet to create a domed lid for some of my filter containers...I think that would be a better idea for a lid on this large nozzle. That way I could just drill out the hole for the brass insert wherever it would create the correct angle for my outer streams. Does that make sense? Example "D" should help out! This way if I created a domed lid, with the o-rings on the outside of the lid, like Mario showed in his thread, then you could use straight brackets to angle the entire container from vertical to X degrees, you could adjust the height vs length of the streams, then by rotating the lid inside the container you could manipulate the streams in a left to right direction. Re: Multiple jets from a single laminar container...Is it possible? B is NOT ok !! B will add turbulence to the water before it exit the nozzle ! The idea was pretty clever ! I have never thought about adding 2 hole into one nozzle. I am glad you confirmed some of my thoughts on A vs B. In my mind it seems as though D would be the best option for multiple jets, but I have never tried this. What is the general rule for the size of the jet? 1" diameter 2"? Has anyone cut threads into the outer ring of the jet, so it can be screwed into the top of the nozzle? It seems like this would be the most secure way to mount the jet.